Today the VA reported that the disability backlog decreased by just over 850 claims last week, meaning about 238,000 veterans are waiting 125 days or more for VA claim decisions. The number of total claims pending is also down, by almost 2,400. 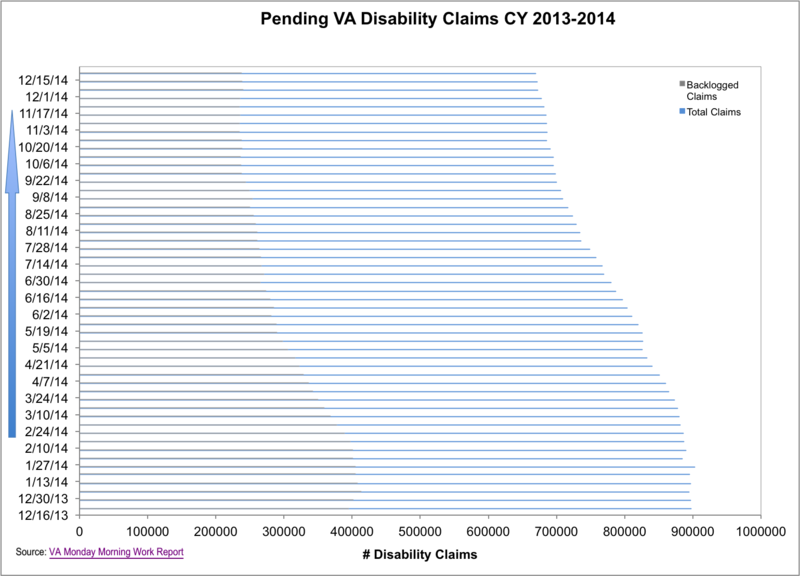 In total, there are just under 516,000 veterans who are waiting to hear from the VA on disability compensation claim decisions. 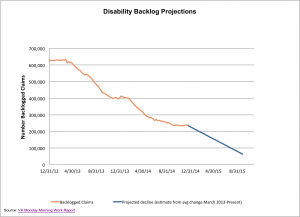 The VA has made great progress in reducing the backlog overall, as it is down more than 62 percent since March 2013. But it is worth noting that in order to eliminate the backlog by the 2015 deadline, the VA will need to reduce the backlog by almost 6,100 claims per week over the next 39 weeks. Below, two graphs show the progress in reducing total pending claims and backlogged claims, as well as the projected decline through FY2015. 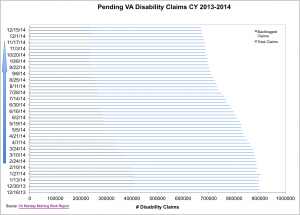 The VA has lost some ground in the last few months with its battle to end the disability claims backlog. With the New Year in sight, we hope to see continued progress and restored momentum. While there is still much work to be done, specifically regarding appeals and claims not grouped in the backlog bundle, there is also no shortage of suggestions and improvements that can be implemented in the coming year. 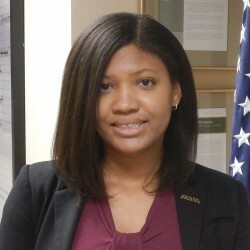 Many of these recommendations are included in IAVA’s 2014 Red Tape Report, which considers the challenges to the VA disability compensation system as well as multiple ways of moving the system forward in spite of these challenges. 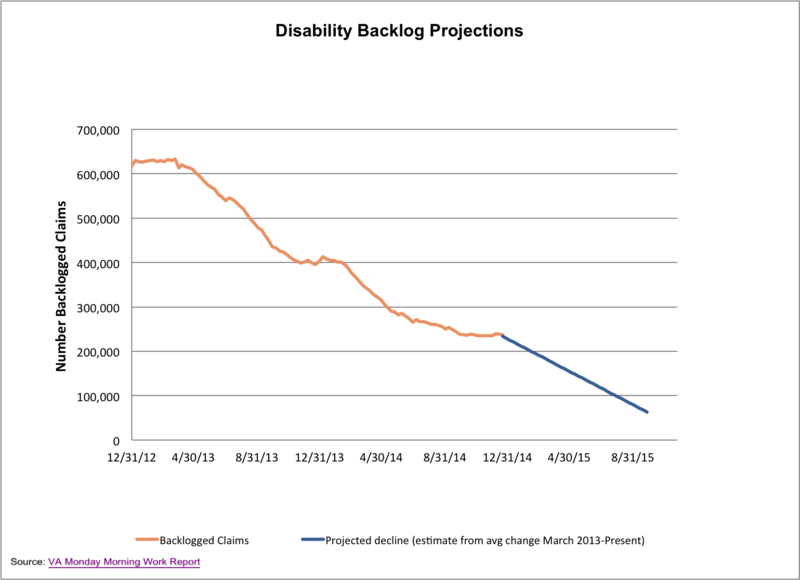 Since last year, the backlog has been reduced significantly, but the work is not done. In this holiday season, we encourage VA leaders to recommit themselves to the elimination of the backlog. Our nation’s veterans and their families deserve our best, and we should work continuously to ensure that they do not wait endlessly for the benefits and support they have earned.